Parkwood unveils new sermon-based Growth Group material today. This new material has one component – Bible Study Guides – designed for everyone and a second component – GG Leader Guides – designed for Growth Group leaders. Each of these Guides will be available one week in advance of the text being preached and studied in GGs during the week. For example, I will preach ‘The Death of John the Baptist’ next Sunday, February 7, so Bible Study Guides and GG Leader Guides are available today in the lobby and downstairs, on the website, and on the City so that you can begin preparing this week for next week’s sermon and next week’s GG discussion. The theological and methodological inspiration for sermon-based GG material comes from the desire that increasing numbers of people would be equipped to study their Bibles and engaged in GG discipleship. To this end, Bible Study Guides introduce a text of Scripture and teach the student of the Word to study the text through several basic steps of Bible study: observe, ask, gospel, apply, and share. These Study Guides secondarily lead the Bible student through a set of discussion questions that will focus on the primary point of the text from a biblical theology perspective. Visual inspiration for the annotated steps of Bible study, while typical of basic hermeneutics (art and science of Bible interpretation) and foundational to exegetical (authority residing in the text and meaning coming from the text rather than being read into the text) study of the Scriptures, originated from an excellent article written by Marshall Segal at desiringGod.org. Segal’s goal is similar to our goal of equipping Christians to study the Scriptures, and his article is also written for the context of small group discipleship. For further preparation, consider reading his article Six Questions to Ask When Studying the Bible in a Group. This new strategy for Growth Group material carries massive potential for the growth of all believers, and I am sincerely encouraged and excited as we begin to make this available today. I pray you will be encouraged as you avail yourself of it, that this material will be as beneficial to you and your GGs as we expect and hope. In the past we have used small group curriculum from Lifeway or Gospel Project, while at times venturing into writing our own curriculum. Certainly we are grateful for the godly men who serve the church through writing these curricula, but Parkwood has determined sermon-based material is the best method for our Growth Groups as well as the best overall approach to Bible interaction. Sermon-based material is the greatest opportunity to accomplish our Growth Group’s four-fold purpose of community, maturity, multiplication, and ministry; and it holds the most potential for encouraging and equipping the greatest number of people in personal study of God’s Word. 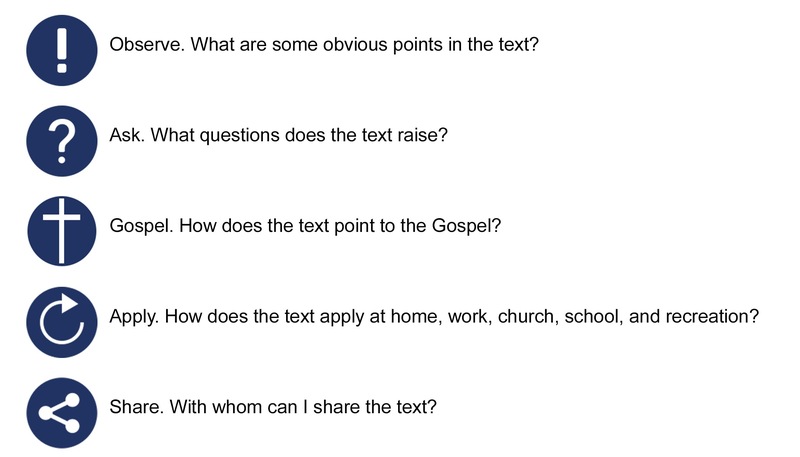 As we begin to publish sermon-based Growth Group material, we are also communicating a process for Bible study in five annotated steps. First, observe. In this first step, the student of God’s Word is encouraged to answer the question, “What do I see?” Practicing the step of observation teaches you not just to read but to read well, to take note of what is obvious while also seeing the detail in the text. Think of the context, the writer, the audience, and the relationship of the passage to the unfolding of redemption and the communication of the gospel. You want to see the main point and take note of what is said less directly. Second, question. Question the text to gain further understanding. Instead of being satisfied with information gained from reading quickly or reading once, ask questions concerning what you do not know or what is not clear. For example, if the text reads, “He went up from there to Bethel…” (1 Kings 2:23), ask both the obvious and the less obvious questions, Who is he? Where is there? Why is here to there said to be going up? and Where and of what significance is Bethel? Answering these questions will lead to greater understanding of the text. Also, intentionally asking and taking time to look for questions will help the reader recognize lack of understanding that may otherwise be overlooked. Third, gospel. In this step, look for the gospel in the text. What does the text say about sin, about man, and about God? Consider whether the text is in the context of the Old Testament or the New Testament, in the context of the covenant of works or of grace, and then consider the corresponding implications for the gospel. The text may indicate a reason for the gospel, a result of the gospel, or an explanation of the gospel. Taking time to reflect on the gospel in various texts will allow the Scripture to inform your understanding, to see the gospel across the Bible, and to thereby increase your admiration for what God is making available in the good news. Fourth, apply. Apply the text to your life. The task of Bible study is not at once completed but fulfilled over time as it is applied to the reader’s life. We study God’s word to know God. Study without application is simply gaining knowledge, which alone puffs up, but knowledge with application is humility and spiritual growth. First read the text and seek understanding. Then pursue application. Ask yourself how you can apply the text at home, at work, in the church, at school, and in recreation. Fifth, share. Having completed steps to understand and apply God’s Word, consider with whom you might share it. I recall a story once told by David Platt. He was teaching internationally and recounted people crowded shoulder to shoulder into a room, even pressing against him, and looking intently at him waiting. Significantly, he never saw the whites of their eyes once he began teaching. The reason, the men gathered were not theologically hungry merely for themselves; they were hungry to hear God’s Word that they might write it down and retell it to others. Let us do the same. Let us hunger after the Word, but then let us be hungry to tell others also. So I would encourage you, embrace the study of God’s Word. In doing so, you can prepare for the sermon, for your Growth Group, and for sharing with others. Should you need help, consider using the steps above: observe, question, gospel, apply, and share. Get a journal and start today!